Toland Art Flags - The Original Art Flag! The Toland Company has over 30 years of experience in the home and garden business so you can be assured that your Toland Flags will give you the outstanding quality you are expecting. All of the Toland Home Garden flags are printed on polyester fabric using the highest quality printing and sublimation process. The images are transferred with heat and pressure into the fabric. The dyes actually become integrated with the fabric providing an unlimited range of color with unsurpassed clarity and definition. The durable, lightweight, wrinkle resistant fabric can actually be laundered. These flags are ideal for indoor/outdoor use with their resistance to mildew and fading from UV light. Toland works closely with top artists and feature many of their flags in their product line. They also pay tribute to some of the greatest artists in history by offering designs by such well-known artists as Van Gogh and Renoir. 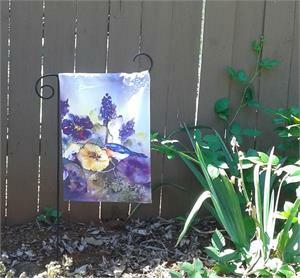 Toland Post Mount Garden Flag Hanger For 12.5" x 18" Garden Flags This Garden Size Post Mount Flag Hanger is perfect to hang your favorite garden flags and can be mounted to any surface.